American Lambs. Preserving Memory. Preserving Us. November 23, 2009 – Rainy, cold, cloudy. November is finally here. Yuk. 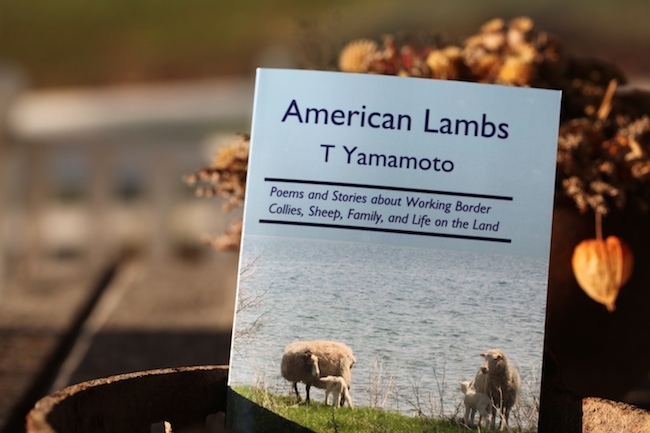 A friend sent me a copy of a new book, American Lambs, by T. Yamamaoto, published by Outrunpress and I had the nicest couple of hours last night reading it. As the cover says, this elegant, elegaic book is a collection of poems and stories about working border collies (and sheep of course) and their families, but beyond that, it’s really a love letter to the beauty, power, and ancient pull of border collies, sheepherding, and the people and places where they have occur. Sheepherding eluded me in many ways, I always loved it, but never had the patience or focus to really master it. It surely touched something deep in me and others. I spent much time on a sheep farm – Raspberry Ridge in Bangor, Pa. – where I first encountered this culture, and will always treasure the sweet mornings when I went out with my dogs and the sheep to grace at first light. Or in the middle of the night. This year, I extensively photographed the closing of a dairy barn in Belcher, N.Y. And I am quite involved taking photos for the Agricultural Stewardship Association (ASA) which is selling calendars as part of its ferocious struggle to preserve farmland from the ravages of development. The ASA just acquired the Grandma Moses farm in Washington County, N.Y. In America, nothing much ever stands in the way of development. Having spent some time in New Jersey, I know only too well what happens if land is not preserved, especially for farming or for rich and evocative cultures like sheep herding. “American Lambs” is a polished, beautifully written and quite diverse collection of pieces that evoke a fading culture of farming, individuality, connection with nature, family and of course, the fabled qualities of the border collie, one of the great working dogs of all time. The book is quiet, the stories touching and understated. There is a mythical quality to the collection. I wish there were more photographs in the book, but it is quite lovely. There are lots of reasons to read and love this collection. You can learn from it, preserve a distinct way of life, or keep it on the shelf in case the day comes when life like this is mostly a memory. And appreciate the power and meaning of a working dog. No creatures changes more lives than a working dog – I have four. The book is based on a place called Bush Island. It is not a real place, but one inspired by a real island off the coast of the Pacific Northwest. The author points out that like many beautiful places in America, this one was first agricultural. Then the farming familes sold out as taxes went up, and the new population didn’t realize that they were obliterating the very things that made them want to live there in the first place. This is an old and familiar story in America. Check out this book at Outrun’s website. Support the ASA calendar. Go to sheepherding trials. Fight to preserve farmland. You will miss it when it’s gone.